This year is our 2nd year in our 1,200 sq ft bungalow in downtown Raleigh. We purchased it while we were spending time in northern Michigan for work two summers back. The day we closed on it was the first time we walked through it and thankfully it was just what we wanted as first-time home-owners. It had been recently updated from top to bottom with electrical, plumbing, insulation, and so on. The interior had been updated as well, but wasn’t 100% our style. We were okay with that, because the cosmetic updates were things we wanted to do. The main selling point to purchasing the home was the 700 sq ft outbuilding behind our house, which we could turn into a studio. You can read all about our home buying experience here and more about our studio updates here if you would like. The hard part of knowing you want to make updates to your home is deciding how you want the updates to be done and what exactly you want to do. When making our decisions what has been most important is that we were staying within reason for the neighborhood we are in. I grew up with parents who built homes and sold them for profit so I knew the importance of staying smart on updates to homes and what added value and what didn’t. Though I lived in homes always partly finished it was a lot of good life lessons on what it meant to successfully own and build equity in real estate. With this home the layout is awesome. I wouldn’t ever change a thing. It is very efficient and smart for 1,200 sq ft and that is huge when thinking about what you will update in a home and where you plan to put your money. We don’t need to move any walls in here, but what it did need was some tile, paint, and light fixture updates. Since purchasing it we have been slowly making updates. The biggest being we have done is painted our whole interior in Behr’s Ultra Pure White. We love modern spaces, but living in a bungalow means lower ceilings and less room for light to move in a space. By making all the walls the purest white we could we were able to make the spaces feel as large as possible while feeling the brightest they can. We love the blank slate that is our home now. Though, Mike can attest that painting every square inch of the walls in our home (including trim) is not an easy or small task. It has been a slow project over the last 6-8 months. Recently we have made updates to tiling and cabinets. 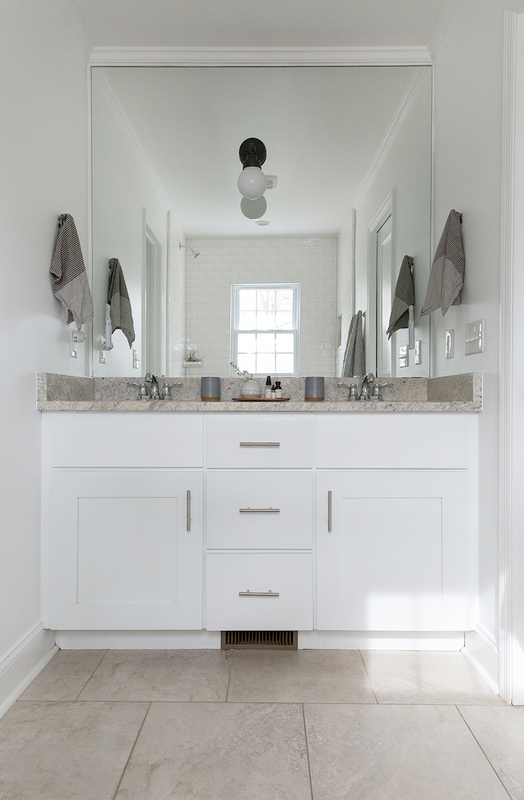 The truth is that there is no lie that bathrooms and kitchens sell homes, and so when thinking about making updates we wanted to focus our budget on these spaces. We have two bathrooms in our home. One is our master bath at the back of our home and the other is our guest bath which is up with our two front bedrooms. 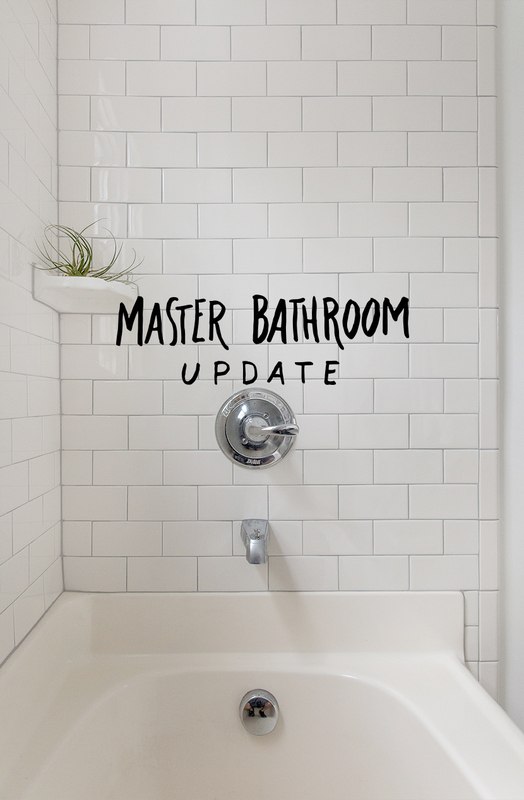 When we started talking about what we wanted to update in our master bath and where we could make the most impact with any updates we had quite the list of dream ideas. We thought it would be great to rip out the tub and do a full tiled shower, replace the window, rip out the giant mirror, and put in an all new countertop and sink. It was serious dreaming and I think if we had been doing the renovation originally this is what we would have opted for, but when thinking about what would offer the most bang for our buck we made some adjustments to our list. We had already painted the room in Behr Ultra Pure White from top to bottom so that was a huge update alone. We then decided to opt for retiling the shower without removing the tub. We decided hat subway tile was the way to go. We talked about updating the floor tiles, but we realized that it wasn’t as big of a deal as the tile in the shower in terms of aesthetics. Floor tile is floor tile and since our’s was quite generic we decided it wasn’t worth an additional $1,000 to update our floors (not to mention the time and mess it entailed). The other thing we opted to do was update the cabinet color and add handles. Though we weren’t crazy about the counter top or the giant mirror we knew these things would be both a lot of money, repairs, and cost that wouldn’t add much value in the long run. You can see the difference that simply updating the cabinets to being white like the walls and adding handles which we picked up at Home Depot, made a huge difference in the space. We also updated the light fixture with this one from Ikea for $20. The final touch was adding new hooks that we got at Home Depot as well for hand towels and towels. 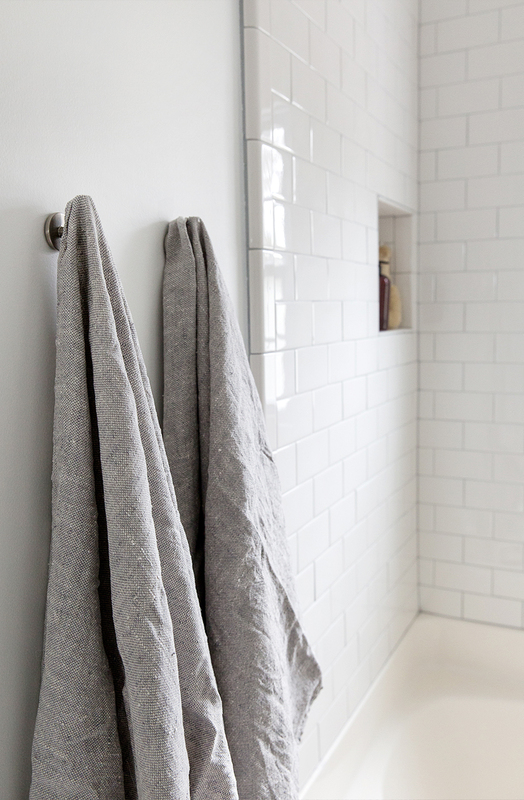 The original towel bar really only had room for one towel so the hooks allowed us to take advantage of the space more efficiently. We opted to have the whole shower retiled in white subway tile with medium gray grout. The grout color was a big decision. I knew I didn’t want white because I didn’t want to be dealing with bleaching the grout to keep it really crisp looking, but the black was too much contrast for me in this space. Thus, the gray won and I love how it turned out. 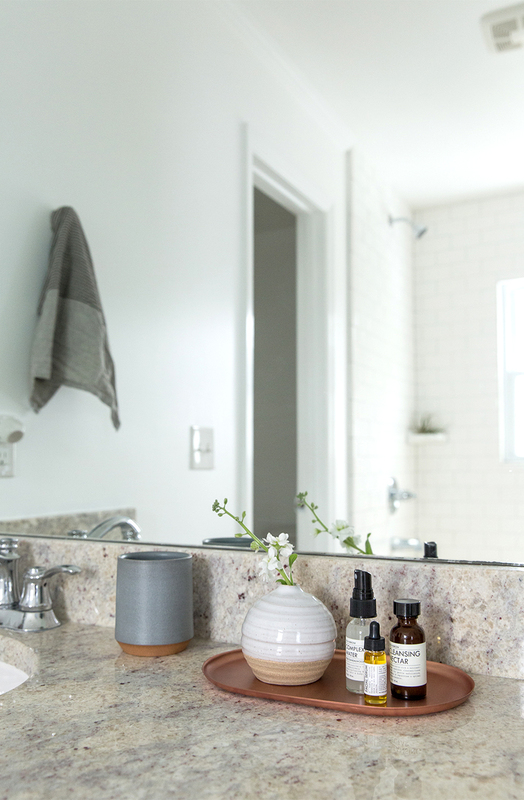 We went with subway tile because it is simple, works for many different interior styles, and connects to the age of the home (built in the 1950’s). We did add in a little built-in shelf for soap, which we felt like was a great feature that cost us nearly nothing with our tile guy. Keeping everything clean and white made the space feel larger, brighter, and much more modern. Though it isn’t the dream bathroom I could imagine for our home, it is perfect for this little bungalow. We also did all of it for under $2,500 and the bathroom literally feels almost brand new. We all see huge sweeping renovations on many blogs and TV shows, which are amazing and inspirational, but they aren’t always realistic for every space. Though this isn’t a massive overhaul, we wanted to share how these small updates made such a great impact to our space. We feel that sometimes it isn’t about making huge changes, but choosing the right changes wisely. Our space matters to us, but it also is important to remember that when you are a homeowner you will possibly one day move on from the home you are in and you want to make sure it has been a good investment for you along the way. As designers, it is easy to get out of control with our space, but learning that small adjustments can make a big impact and find contentment in that is so important when owning a home. One day I will get that tiled shower I was dreaming about, but for now this bright and simple bathroom is perfect for us and I couldn’t be happier. Have you ever made a small adjustment to your home that felt like it made a huge difference? Let’s hear your story. 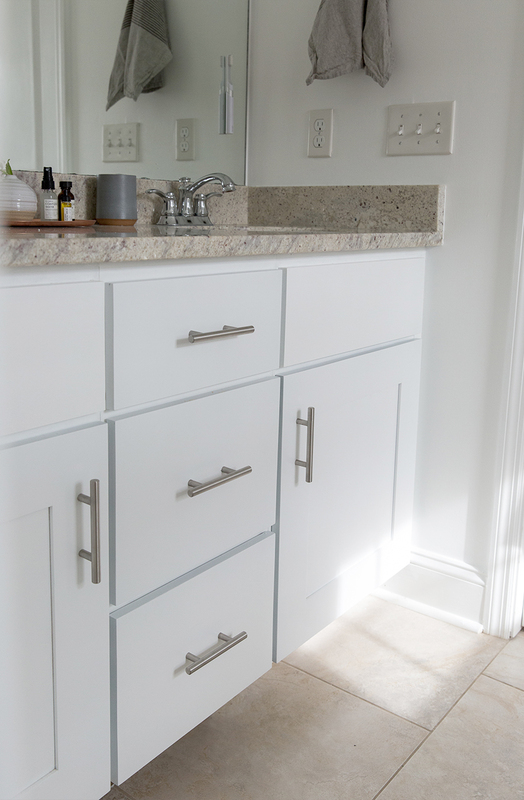 For those in the Raleigh area, we used N-hance to redo our cabinets in the bathroom and if you would like the name of our tile guy feel free to email us and we would be happy to pass along his info. The wall color is Ultra Pure White from Behr Paint in Marquee finish. The walls are Matte and the trim and doors are Semi-gloss. Love how your bathroom turned out. Isn’t it amazing that sometimes all a room needs is just a little love as oppose to a total gut out? I love the new bathroom! White is my go to color. I really love the shelf you all put in the shower as well, small way to add a big pop. ThE white tiles and cabinets really made the bathroom pop! Such a great update that will allow you to enjoy the space for years to come. It looks absolutely gorgeous! We bought our house around the same time you did. It’s a small, 2 bed, 1100 sq ft, 1927 home. It has so much character and charm, and the previous owners had also recently redone the kitchen and bathroom. They look beautiful, but they are not quite our style. We haven’t gotten around to changing much, except the color of the walls. It makes such a big difference. 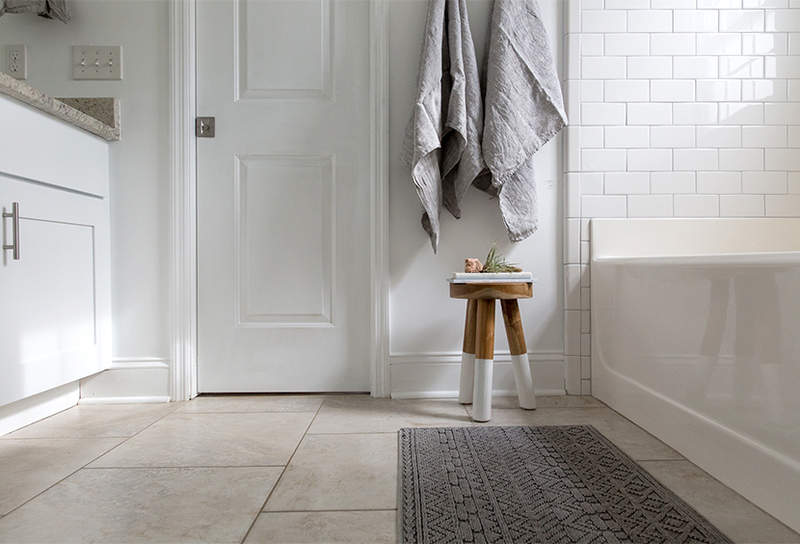 Your reno looks beautiful – clean, simple, modern and perfect for lots of different styles. Hope you’re enjoying these first days with your sweet boy! It looks great! one question: where’s your shower curtain? I love the white subway tile!! So clean & pretty! The bathroom turned out SO great. 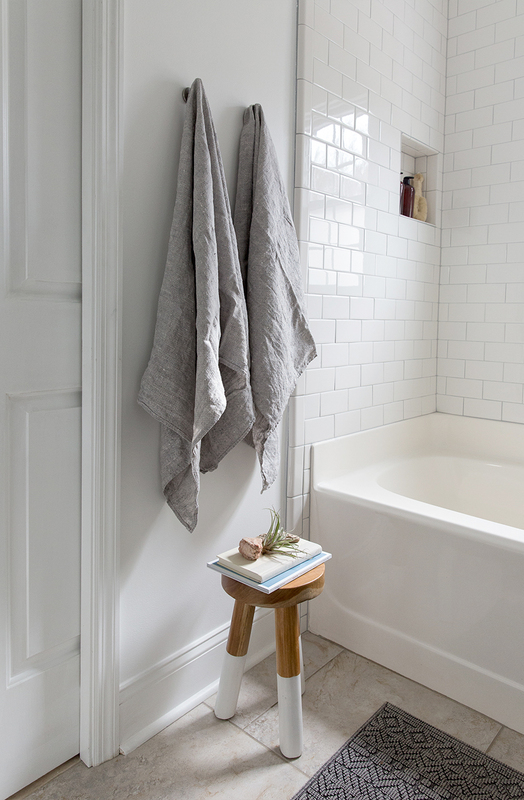 White bathrooms are always the way to go, makes the space feel so much brighter. Wow. Beautiful updates that make such a difference! Sometimes full blown luxury is so unnecessary. Your changes were smart and stunning. I want to do this! When my husband and I bought our house we knew we’d be gut renovating the master ensuite bathroom and while we had the ambition and budget to do a crazy amazing dream bathroom, in the end we kept it simple and fresh because that’s what matched the rest of our house. We didn’t want to make the bathroom so nice that it made the rest of the master suite space look cruddy, ya know? I did white grout for my subway tile and I definitely regret it; what makes it sting worse is that I had already done light grey grout in our kitchen and I knew I loved the look and ease of maintenance for it. I love it! It’s wonderful how the floor tile and vanity granite look so perfect with the other changes you made! Great job! This is so beautifully done! Thank you for sharing! 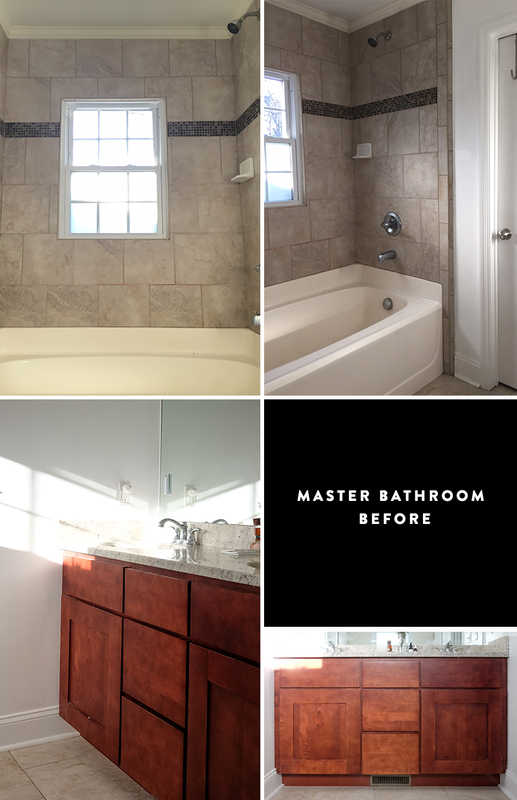 wow you did a great job on the master bath! love the simple decor, so clean =o) looking forward to more updates! LovE the New bathroom look. We are hoping to remodel or update our MasterBath. This is giving me inspiration! But, where is the shower curtain? Are you using one? Looks awesome! Love how you made a huge impact with small simple improvements! Love the white! I wish this was my bathroom! I can’t believe the difference! looks amazing, miss lady!